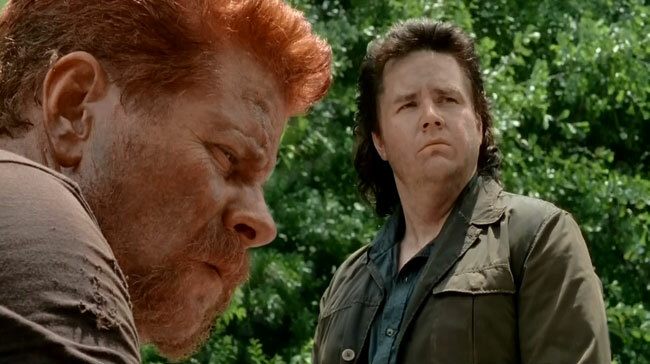 Things really got hairy in The Walking Dead episode “Self Help” which is named after the bookstore section where Eugene (Josh McDermitt) spies on a sexual encounter between Abraham (Michael Cudlitz) and Rosita (Christian Serratos). While traveling to D.C. Rosita offers to cut Abraham’s hair, which isn’t the only thing getting wild. “Maybe I’ll let you shave me down all over, dolphin smooth,” he teases her. Tara (Alanna Masterson) suggests they chop off Eugene’s mullet unless it’s the source of his power like Samson. He tells Rosita to keep her scissors way from his hair. Maggie (Lauren Cohan) agrees that he’s no Samson but insists that’s not such a bad thing. She cites Samson’s riddle that only he knew the answer to. The talk causes Eugene to reflect on his own dilemma. When the group is confronted with a road blocked by zombies Eugene confesses he lied about being a scientist in order to convince the others to protect him. Abraham snaps and knocks out Eugene, who lands face first into the pavement. 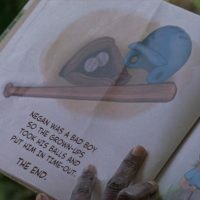 A flashback reveals Abraham was about to commit suicide after the death of his family but was talked out it by Eugene and his supposed zombie cure. Cudlitz was more amicable on The Talking Dead. 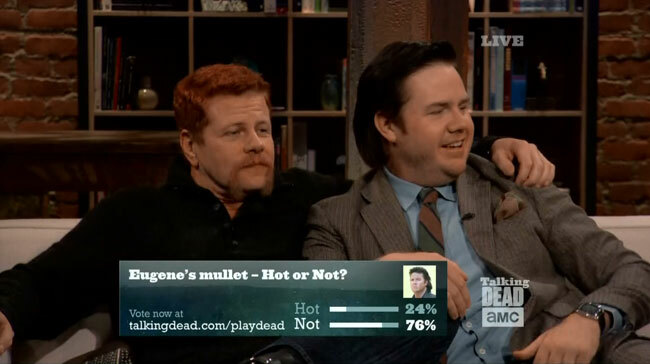 He comforted McDermitt after the results of a poll declared the mullet was “not hot.” Cudlitz disagreed and the two men cuddled on the couch. “That’s why they call him cuddly Cudlitz,” noted producer Gale Anne Hurd. 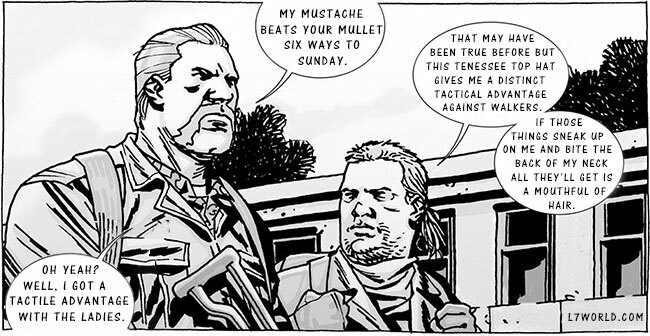 Unfortunately, there was no such poll for Abraham’s mustache but I think we all know the outcome of Abraham’s mustache VS Eugene’s mullet. 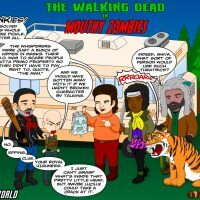 Cudlitz tweeted that he was eager to see the match-up so we’ve made it happened by re-imagining The Walking Dead comic book panel. The result is a draw (sorta). The Walking Dead airs Sunday 9PM on AMC.